What Does Hassle-Free Pricing Mean? What’s Your Favorite Grand Island Restaurant? Looking to grab a bite to eat in Grand Island? Check out our list of the best restaurants in Grand Island, courtesy of the locals at Midway CDJR in Kearney, NE. A burger lover’s dream with decadent burgers like the classic swiss mushroom, sliders for lighter appetites, and vegetarian choices for those who prefer to leave meat off their plate, Sin City Grill in Grand Island, NE, offers plenty for locals to love. Check out their salads and breakfast plates too! If Asian cuisine is more your style, the fresh sushi at Fuji Steakhouse is sure to delight! They have cooked and raw options on the menu, as well as vegetarian dishes, tempura options, noodle meals and, of course, Hibachi shrimp and steak for the carnivore in your party. Located just 30 to 45 minutes away from Grand Island in Hastings, the Back Alley Bakery offers a divine selection of soups and sandwiches made on hearty artisan breads, as well as classic pizza. And, if you’re in the market for locally made products, you’ll find them for sale in the shop as well. If you love your food with a little Island flare, Wave is the place to be. The menu features a wide variety of seafood and salad dishes, as well as specialty pizzas designed to make your mouth water. Try their delicious pork roll with Habanero Jack cheese. For dessert, there’s no place we’d rather be than the Dessert Bar on 3rd Street in Grand Island. Their menu offers a variety of cakes, truffles and other delights. The shop also has a variety of lunch items including wraps, gourmet sandwiches, soups, and the like. Finding the best places in Grand Island or Hastings for you to enjoy a meal in our community is just part of our commitment to you. Come see why, for more than 95 years, we’ve been an automotive fixture, as well as a source for information about the coolest places to visit in Grand Island, Kearney, and the surrounding areas. 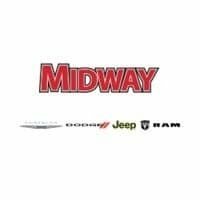 Contact Midway CDJR today to learn more.